Hello bloggers! 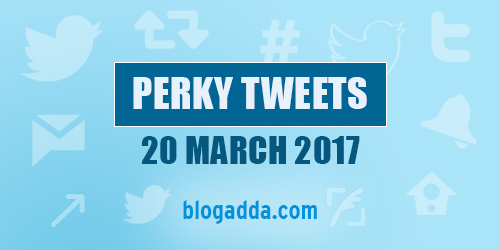 At the start of every week, we bring to you #PerkyTweets to make your Monday a little less agonising after the lovely weekend you just had! Here are some of the funny tweets doing the rounds this week. We are back with our Monday #PerkyTweets edition. As is obvious, we couldn’t stay away any longer from bringing together the funniest tweets on Twitter just for you. Here are perky tweets from the last week to drive away your Monday blues. Good morning lovely people! Let’s kick-start the day with laughter therapy. Monday’s are usually mundane with loads of work at our desks. To refill your day with humor and fun, we bring to you this week’s best #PerkyTweets that will make you chuckle all day. Read these funniest lines and wipe away all the boredom. Hello lovely people! We wish you a very Happy New Year. Let’s kick start this year with loads of laughter and humour. It’s true if all goes well, it ends well. So, amigos get ready as we bring to you this year’s best #PerkyTweets of the week. These will definitely make you laugh till you drop. Catch up with these funny 2017 tweets! Good morning peeps! Christmas just left us astound with its immense love, joy and peace. We are sure you had fun filled festive weekend. Now its time you add more fun and craziness to another week’s start. We bring to you some of the funniest tweets of this week to make you chuckle all day. Are you ready to laugh out louder with #PerkyTweets dose? Then get ready and read these best tweets from our twitteratis! Good morning amigos! Still wish to laugh and continue the weekend fun and frolic even on Monday? Then here’s this salver we bring to you full of funny tweets to make you chuckle. Enthrall with some good laughter the entire day and forget the Monday blues. Pick up your laptop or cell phone and slide through these funny liners called #PerkyTweets of this week. Our twitter pals never leave a chance to get a big curve on our lips. Take a look!